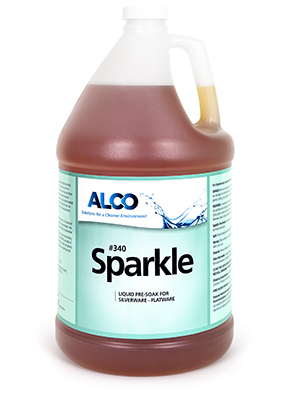 Alco Sparkle - Alco-Chem, Inc. Concentrated liquid detergent and detarnisher for your dishwashing system. Removes tough food soils from stainless flatware or silver. Simply soak utensils in a hot water solution of Sparkle before each machine washing.